Sometimes when the light bulb goes off, you experience a moment of clarity. And sometimes the light bulb signifies something resembling more of an “UH O” feeling. I, of course, experienced the latter today. It came with the realization that my graduation date is a mere EIGHT WEEKS away. What should bring nothing but pure joy ..brings anxiety & more stress than I am equipped to deal with. All I can say is if I successfully make it without a disastrous breakdown ..I will finally hold in my hands a college diploma & will be on my way to New York City!!! Why am I stressed during what should be a happy time in my life? Let me tell you. For one, venting does help and reading the amount of things I must accomplish in 8 weeks is somewhat of a twisted motivational tool. And for two, I am sure thousands of people out there have experienced the same thing and can offer me some “You won’t die. You will make it” words of advice. I must start with my final semester of college course load, 20 semester hours OR 7 classes (whatever you prefer). Granted 3 of those semester hours were a SUMMER online class that I willfully extended to Dec. 1st (good idea chelsea, NOT). Anywho, along with a million classes comes the 3 business plans I must complete, 3 research papers, a bunch of random assignments, a large consulting project, and of course 5+ exams. BREATHE. That alone ..doable. The problem arises with the other things I graciously take on!! I am interning with an AMAZING company, Dream Careers, who placed me in my internship in London. I manage 18 students on various campuses & love it. (That is not one of my daunting tasks, more of my enjoyable one). Then there is my part time job. 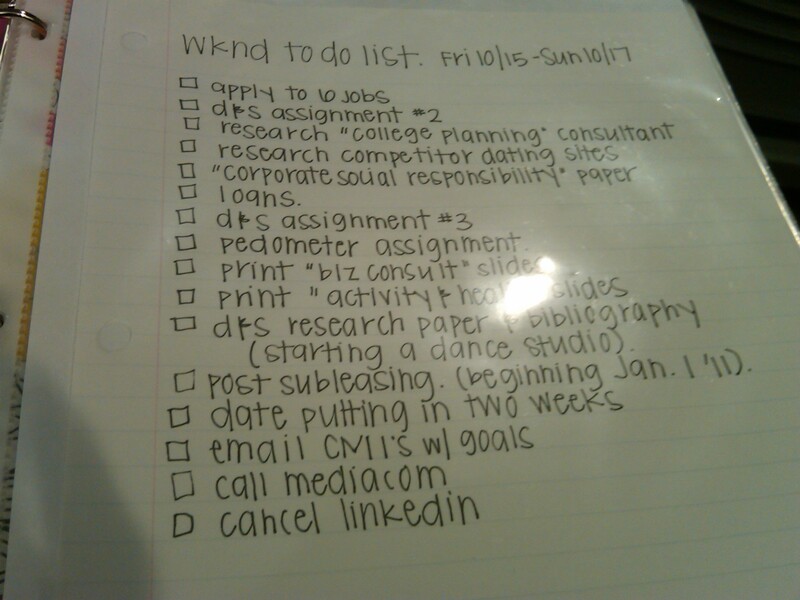 And the things on my “Before I Graduate To Do” list. 1) FIND a “real life” job. 2) Pay tuition (so I can graduate). 3) Do well & complete my classes (so I can graduate). 4) Put in my two weeks at my part-time job, since my days in this city are numbered. 5) Find a subleaser for my current apartment. 6) Go through allllll of my belongings and decided what I can live without (since my move to New York will need to be a light one). 7) Buy my one-way plane ticket. 8) GRADUATE. 9) Move out of my apartment & relocate for the holidays to my parentals. Next Next post: “life is a runaway train you can’t wait to jump on” -sugarland.